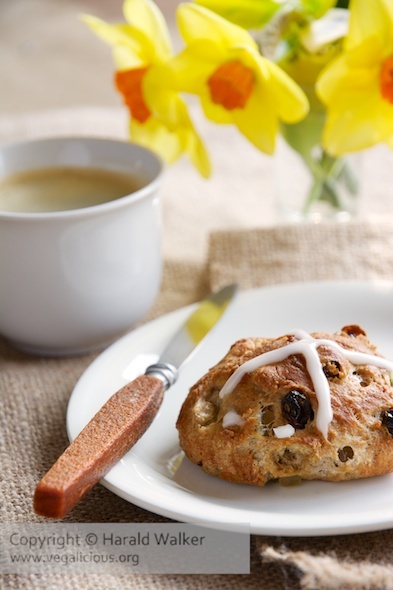 Hot crossed buns are usually made at Easter-time, but they are a really nice treat anytime. Place the flour, salt and spices in a bowl. Add the 1 tablespoon sugar, raisins or currents and citron. Place the yeast, 1 teaspoon of sugar and warm water in a small bowl and allow to bubble for a few minutes. Add the wet ingredients to the dry and mix (I used a fork). Place plastic wrap or a wet towel over the top of the bowl and place the bowl in a warm spot for the dough to raise. When the dough has doubled in size, preheat the oven to 425 F / 218 C, and form 6 buns. Place the buns on a rimmed baking sheet with baking parchment. Place in the oven to bake for 10-15 minutes. While the buns are baking, make the frosting for the crosses. Mix the powdered sugar, vanilla and non-dairy creamer into a thick mixture. Place the mixture in a pastry bag or decorating tube. When the buns are done remove from the oven and allow to cool on a rack. 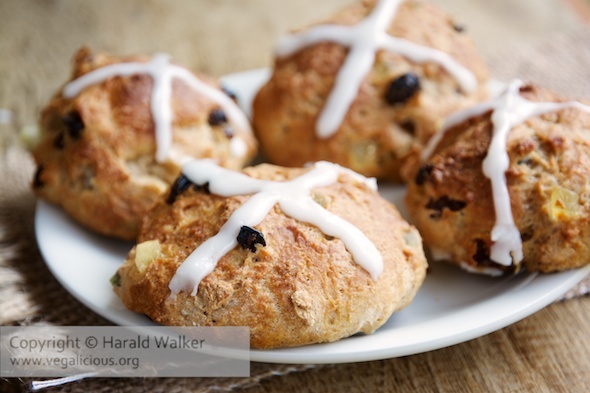 Once, cooled, decorate the buns with a cross. We enjoyed the buns with a fresh cup of coffee. Posted by Chris Walker on April 9, 2014 in Breads and Muffins.